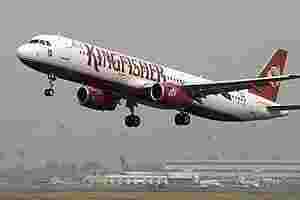 Mumbai: Shares in cash-strapped Kingfisher Airlines rose more than 7% on Monday after reports the cash-strapped Indian carrier would consider proposals, including selling property, to cut its $1.3 billion debt by more than half. • Quick Edit | Too big to fail? If approved, the proposals will help the company to get badly needed bank loans to run its operations. Company officials were not immediately available for comment on the report. Shares in Kingfisher, controlled by flamboyant liquor baron Vijay Mallya, climbed 7.6% in a firm Mumbai market, after plunging as much as 18% on Friday to their lowest since launch. The carrier has become one of the main casualties of high fuel costs and a fierce price war between a handful of airlines which, between them, have ordered hundreds of aircraft for delivery over the next decade in an ambitious bet on the future. The Centre for Asia Pacific Aviation (CAPA) has forecast a record $2.5 billion to $3 billion loss for Indian airlines for the year ending March 2012, with state-run Air India alone likely to account for more than half of it. The airline, which had cancelled about 200 flights in the past week, is likely to propose a preferential issue of shares to investors, to meet a key demand of banks that are insisting its billionaire-founder Mallya bring in more funds, the newspaper said. It said State Bank of India, the lead lender in a 13-bank consortium, and other banks had asked the carrier’s owners to inject Rs800 crore ($160 million) in equity. “Kingfisher is a valued company, but an airline would need fuel, fleet and finance to run the show. Kingfisher should tell us how it plans to streamline its daily requirements," the paper quoted State Bank chairman Pratip Chaudhuri as saying. The newspaper said Kingfisher would approach banks for up to Rs500 crore of working capital to buy fuel and pay salaries, citing unnamed people familiar with the development. Kingfisher chief executive Sanjay Aggarwal refused to comment on the additional working capital, but confirmed the airline was planning to raise funds by changing the nature of lease agreements and selling real estate, the paper said. “All this exercise is going to reduce our interest costs that are pinching us a lot right now and reduce debt levels to reasonable limit," it quoted him as saying. Rival Jet Airways (India) Ltd, India’s top airline by market share, said on Friday it swung to a net loss of Rs713 crore in the September quarter from a profit of Rs124 million a year ago, due to a 41% jump in fuel prices and losses caused by a depreciating rupee. Budget carrier SpiceJet posted a net loss of Rs240 crore for July-September, compared with a net profit of 101.1 million a year earlier. Six weeks ago Kingfisher announced plans to recast its business model by doing away with its low-cost service. On Friday, it said it was dropping unprofitable routes and speeding up a fleet reconfiguration, which would see its daily schedule of flights drop to 300 from 340.